Thank you very much for informing me that the Institute for the Research of Crimes Against Humanity and International Law, at the University of Sarajevo, has recognized my modest work in attempting to raise awareness of the genocide in Srebrenica. 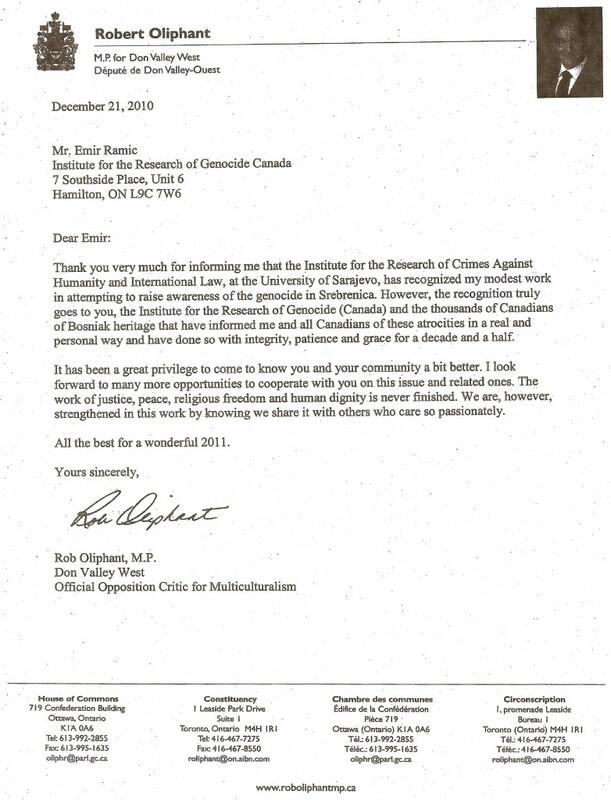 However, the recognition truly goes to you, the Institute for the Research of Genocide (Canada) and the thousands of Canadians of Bosniak heritage that have informed me and all Canadians of these atrocities in a real and personal way and have done so with integrity, patience and grace for a decade and a half. It has been a great privilege to come to know you and your community a bit better. I look forward to many more opportunities to cooperate with you on this issue and related ones. The work of justice, peace, religious freedom and human dignity is never finished. We are, however, strengthened in this work by knowing we share it with others who care so passionately. All the b est for a wonderful 2011.